If one of your resolutions was to be kinder to your body and be more conscious of what you put into it I have the perfect healthy, sweet treat for you. Healthy and tastes indulgent? I know what you're thinking, but it's true! 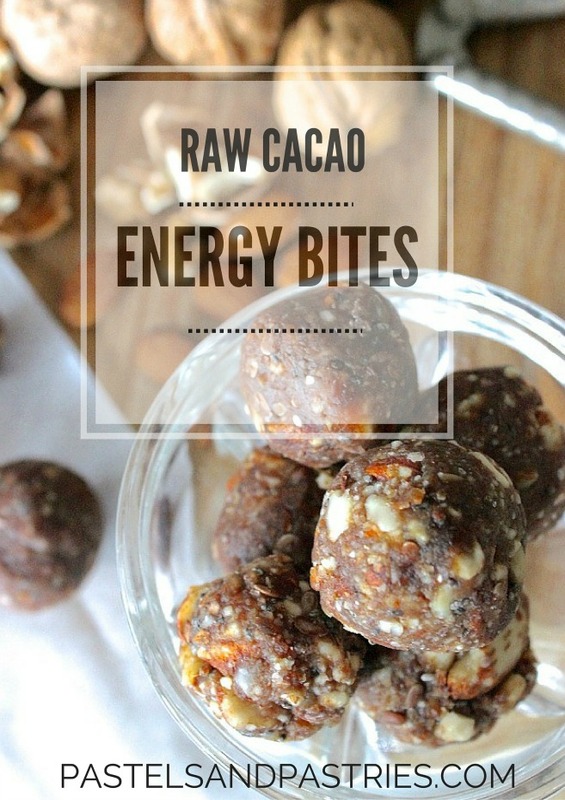 Rest assured, these little energy balls are filled with super food goodness and will completely crush any chocolate craving! 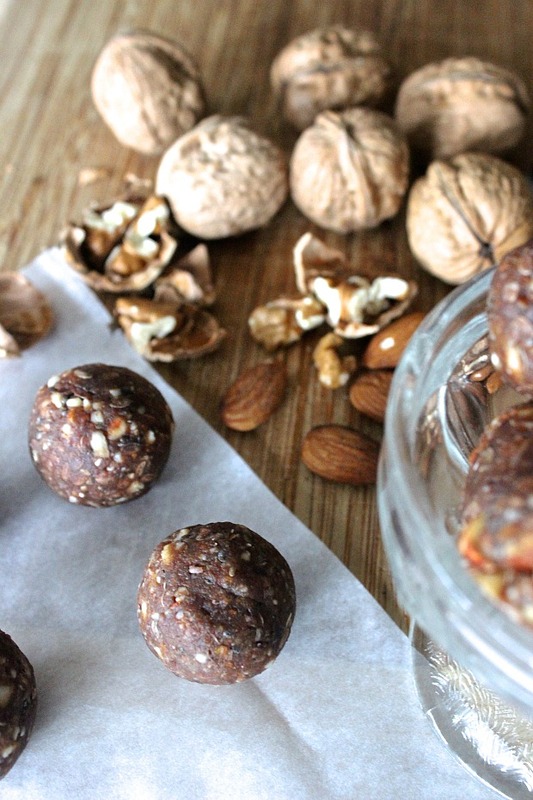 Have you been into making raw energy balls? 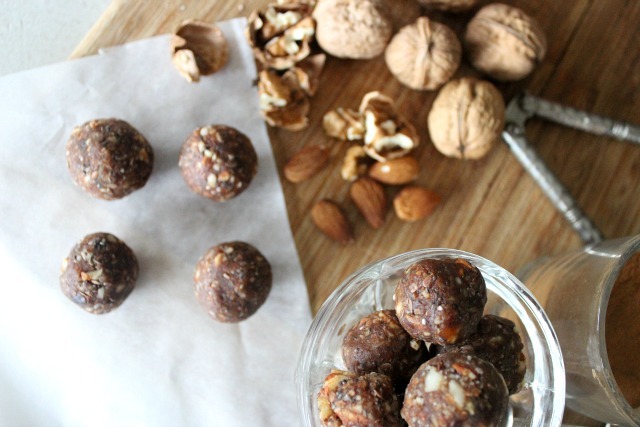 I love trying out healthy recipes and am addicted to making these little balls to store in the freezer (you probably saw my Homemade Cookie Dough Larabars). These little babies pack a nice energy punch, too. We have necessary omegas from the walnuts and chia seeds, fiber from the flax, the coconut oil to give you energy and help you burn off more fat, and the raw cacao to up the flavour and give you an antioxidant boost. I adapted the recipe from Deliciously Ella (Ultimate Energy Bites) simply because I didn't have any hemp protein around, but I find they rid the hanger just fine without it. They are the perfect healthy treat, require no baking and take probably all of 5 minutes to throw together. I love storing them in my freezer for when those cravings come along. Also they pair impeccably well with a mid-afternoon almond milk cappuccino. Using a blender (I use a Magic Bullet), blend almonds, walnuts, chia seeds, ground flax until crumb like texture. Add the coconut oil, raw cacao powder and pitted dates. **If the mixture is too thick to blend, add in water, one tablespoon at a time. Roll into balls and place in freezer. *Tip: spread your favourite nut butter on top for a SERIOUS treat! LOVE this recipe Gabriella, thank you so much for sharing! I'm definitely going to try making these as a part of my new resolve to eat healthier. You're very welcome! I always have a batch of these on hand. So good! These look so amazing, I love little energy balls! I noticed you're from Toronto, have you ever been to Fuel+? They have these fuel balls which are little energy balls that taste AMAZING. I'd always get them as a little after school treat. I have like all the ingredients to make these right now, yes! I'll definitely have to check out Fuel+! I've never been! Are you from Toronto as well, Sally? We should connect! These look delicious! I don't know if you've heard of Nakd Bars, but it reminds me so much of them - plus it's homemade! I'll have to try it out for sure. Thanks for sharing pretty lady! I've never tried a Nakd Bar! But I'm always looking for snacks to take on the go. Will definitely check them out next time I'm shopping! Thanks, Saffat!